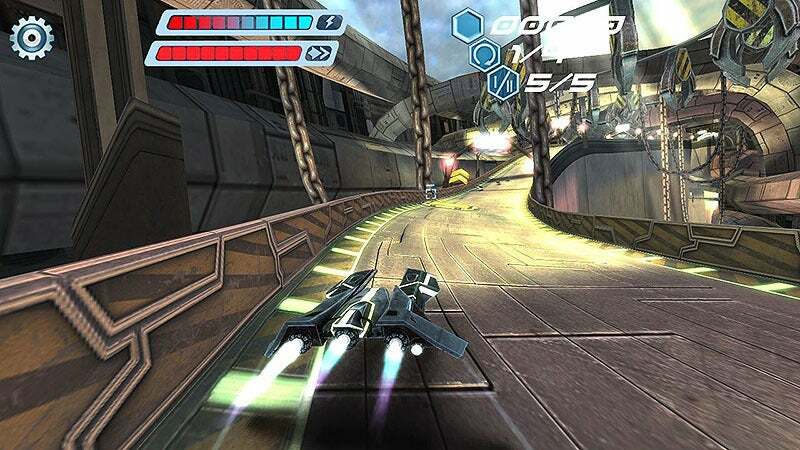 Flashout 3D could be described as Sonic & Sega All-Stars Racing for grown-ups, as it replaces the neon colors of the Sonic game for the gleaming metal of futuristic flyers straight out of a Star Wars-like universe. In fact, Flashout wears its influences on its sleeve quite blatantly. Some of the vehicles that you can buy look just like Tie Fighters from Star Wars, while the racing action is clearly following in the skid-marks of the classic Wipeout. Even so, Flashout is well-presented, with attractive graphics and a variety of game modes that will help while away a few idle moments during lunchtime at work. There’s a hugely annoying techno soundtrack—thankfully, you can turn this off, but it’s a shame that you can’t listen to your own iTunes music during races, as driving in silence spoils the fun a bit. The game includes a career mode that allows you to tackle a series of races on tracks all around the world, but the Blade Runner art design looks pretty much the same from one track to another, so there’s no real sense of location as you work your way around the world. However, winning races does allow you to buy new vehicles with different speed and handling properties, as well as buying upgrades such as a machine gun or rocket launcher that you can use to eliminate the opposition. 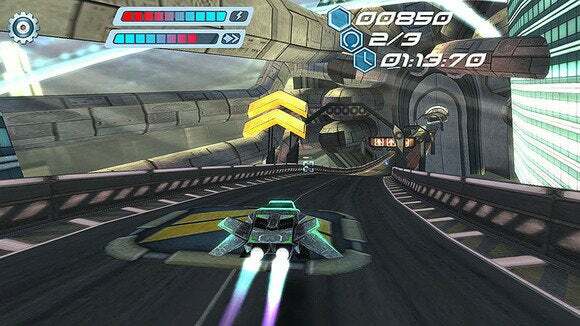 A time-trial mode and a single-race option let you practice your racing skills. It’s all technically quite solid, and the sensation of speed as you hurtle around the gravity-defying twists and turns of each race track is quite convincing. For a while, it’s quite good fun to spend your winnings on new weapons and learning how to blast your opponents off the track. But after a few races I started to find that Flashout simply wasn’t very challenging. There’s not much driving skill involved as your racer barely even slows down when you hit the barriers at the side of the road. The only thing that really slowed me down was the occasional collision with a landmine, and even that simply bumps you back to the last checkpoint rather than ending the race or inflicting any real damage. Even your weapons becomes rather routine after a while, as your defunct opponents simply vanish in rather underwhelming puff of smoke rather than providing the satisfaction of a metal-mangling explosion. There’s no multiplayer mode either, although the developers are apparently planning to add multiplayer in the future. Flashout 3D is technically competent enough to while away a few idle moments. However, it lacks the excitement and challenge of the best racing games, and probably works much better when you’re playing it on an iPhone on the train to work in the morning. You'll find some instant gratification with Flashout 3D, but in the long run, it's not a very challenging game.